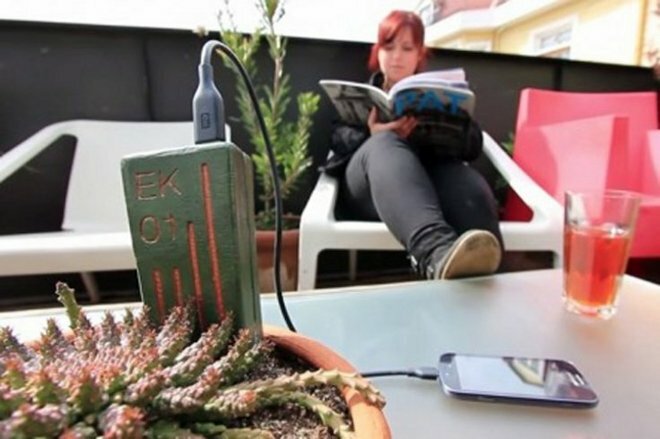 In want of a free wall outlet, future mobile phone users could simply plug in to the nearest cactus thanks to a new system called E-Kaia— developed by a team of researchers in Chile— that collects the leftover energy from photosynthesis. E-Kaia can charge small devices, like mobile phones or LED lights, using a single healthy plant. As noted by the Manquehue Institute, the E-Kaia team says its invention can output as much as 5 volts at 0.6 amps. For comparison, Apple's ultra-compact USB power adapter— included with the iPhone —pushes 5 volts at 1 amp. Energy is captured from the plant via a "biocircuit board," though further details of E-Kaia's inner workings are scant. The group is reluctant to say more while its patents are still under review. Creators Evelyn Aravena, Carolina Guerrero, and Camila Rupcich hope to commercialize E-Kaia this year, having received funding from the economic development arm of the Chilean government. E-Kaia is not the first system of this type, but if the technology holds up it would prove to be by far the most efficient. Plant-e, based in the Netherlands, says its competing solution requires 100 square meters of plants to harvest a similar amount of energy.